Though I am a movie critic and many times when I go into a film I’m looking at it through an analytical lens; I am still one of the biggest cinephiles I know and want nothing more than have a pleasant time watching a marvelous (pardon the pun) film in my natural habitat: the movie theatre. I have been excited for the 18th Marvel Cinematic Universe installment since I learned of its inception and each bit of news (Ryan Coogler directing, Chadwick Boseman starring, Michael B. Jordan casting, Kendrick Lamar lending music) I became more and more enthusiastic. I worried the overhype may sully my experience like it has for so many movies prior. Luckily, I was nowhere ready for what was presented to me. Since the Star Wars: The Last Jedi debacle I’ve been worried to state that a film will be universally praised, but I don’t see a way in which theatre-goers could deem Black Panther a failure. The film has a 97% on Rotten Tomatoes; this isn’t a rating but an aggregate percentage of critics who gave it a positive rating. You know what’s more bizarre than the fact it reached 263 fresh reviews? Is that somehow 9 critics had the audacity to proclaim the film a failure. Their entitled to their opinion, much like I am mine, I’m just quite literally baffled to learn it for I don’t see a practical and accurately-unbiased way in which someone doesn’t enjoy the film. Black Panther is unlike any other MCU film in that it’s mature; it’s the ultimate evolution we had always hoped the films would become and stands alone as undoubtedly the best origin film yet and arguably the greatest film in the decade long franchise. Black Panther picks up after the events of Captain America: Civil War with T’Challa taking the throne and the title of Black Panther after the death of his father. The new king must deal with threats, foreign and domestic, and learn that what he wants for himself and his people may not be what the world truly needs. The cast is as spectacular you’ll see for the first in a hero’s franchise. 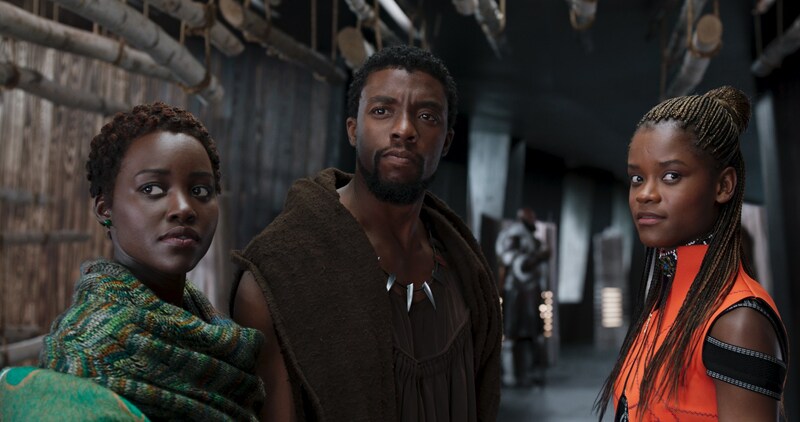 The cast includes Chadwick Boseman, Lupita Nyong’o, Danai Gurira, Michael B. Jordan, Martin Freeman, Daniel Kaluuya, Letitia Wright, Winston Duke, Sterling K. Brown, Andy Serkis, Angela Bassett, and Forest Whitaker. Though some of the stars shine brighter than others, not one actor gives less than a stellar performance and Coogler gives each a chance to truly stretch their abilities. When the only criticism I have for the acting across the board is Freeman’s atrocious American accent, it was pretty damn well acted (even then, Serkis’ South African dialect is astounding and makes up for Freeman’s shortcoming). 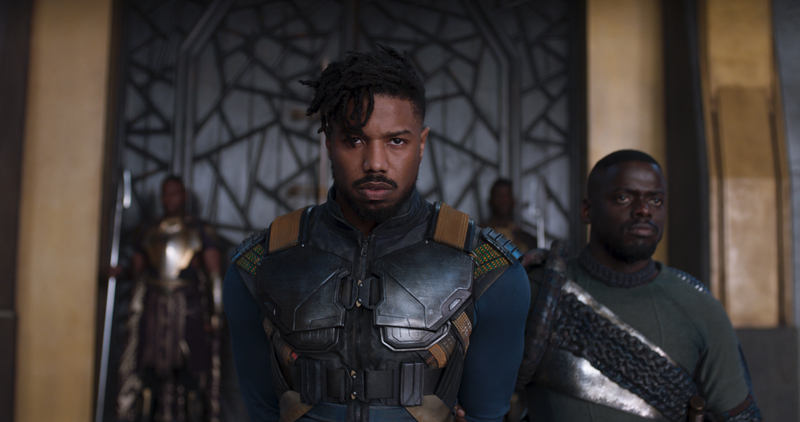 I’ll delve into Michael B. Jordan’s villain in depth later in the review, but I’d be remise to not highlight his performance as Killmonger in all of its sympathy and menace. The 31-year-old director only had two feature films to his name before embarking on the Marvel train but the two features, Fruitvale Station and Creed, were impactful in their respective genres. Ryan Coogler’s direction and distinct polish have always been apparent but not with the budget allotted for Black Panther. Coogler’s recipe of comedy and drama was a perfect ratio, one that made it feel more established than most blockbusters as of late. The jokes may not be as copious as other MCU flicks, but it flowed perfectly with the seriousness of the narrative. As for Coogler’s filmmaking, watching the camera bob and weave in a mini one-take while young boys play basketball would be a throw-away scene to many filmmakers but to Coogler it’s an opportunity to make something beautiful and showcase his care for every frame. Reteaming with Fruitvale Station cinematographer Rachel Morrison, who’s currently nominated at the Academy Awards for Mudbound, was an excellent choice and they were able to show their passion and devotion to the aesthetic of Wakanda, the action, and the characters. The delicacy and originality in which the duo filmed the action sequences were astounding and spell-binding; fast-paced yet not jarring, I wouldn’t be surprised to see future directors espouse the practice. A blunt statement but the inclusive atmosphere of Wakanda’s world-building, in aspects of visuals, culture, and mythos was equal too if not superior than staples such as Blade Runner, Avatar, and Mad Max: Fury Road. The complexation of the developed African nation was gorgeous in actuality and thought; a concoction of vibrant colours and traditional African garb, the city streets looked like the actual progression of African culture turned to a Tokyo style contemporary. The way in which the script decided to teach us about Wakandan culture through plot was something that so many present blockbusters fail miserably at. Instead of having an exposition machine hand-feed us the information we absorb the traditions and heritage as we see the citizens go through their ancient customs. Many worried, or anticipated, the political attitude the film would flirt with. Not only is it fascinating and something that needs to be addressed, but it doesn’t make it a black and white issue. I won’t spoil it here, but it’s a complicated issue that has even the King T’Challa internally struggling with to find the correct answer. Most of the political aspect comes from the villain, Killmonger, and his motivation. Not only is he merciless and ferocious, but he has understood and viable hatred in his heart. He’s still monstrous and his actions are despicable, but the audience and the King of Wakanda understand his wrath. Undeniably in the top three MCU villains with Vulture and Loki; he may not be as menacing or prosperous as they, but his agency has reason that can’t be denied. I loved this film irrefutably and predict it to be one of my favourites of the year. I wholly expect to proclaim my praise for it for as long as people will listen. As a white-male I feel that at times I can’t be as passionate about projects/movements because I have no relationship to the underrepresented. I feel that it’s important to cross cultural boarders and strive for things that may not attribute to yourself. I cannot express how glad I am that not only the first predominately Black blockbuster will be fiscally successful and lead to a trend of studios willing to take a chance minority starring films they otherwise wouldn’t, but that because of its passionate cast and crew, it was utterly incredible.